Unbeknownst, the blonde in seat 24D was factually describing the multitude of roles Nebraska’s athletic trainers fulfilled throughout the course of a day. (Although she did forget to mention the roles of counselor, surrogate father, messenger, and all-around indispensable healer.) Doak Ostergard was that kind of a man. The youngest of the full-time staff, he was a bridge between the college kids and the coaches, alternately acting the bothersome juvenile & sage elder when with the kids, then as a point of contact in bridging the player/coach chasm with the staff. Doak, for lack of a better word, was ‘the finger,’ constantly taking the pulse of the athletic department at the place where the rubber meets the road: the athletes. He built strong bonds with the kids and had an uncanny ability to know what went on behind closed, off-campus doors, the shenanigans happening long after the bars closed on O Street. Let’s hear now from Doak Ostergard, Certified Tape Guy. Doak Ostergard: I hope I have something to add. DO: Well, as a trainer you got to see a completely different side of them. To me, the training room, weight room, equipment room, you’re in the trenches, the front line. The dynamics of the relationship are completely different and you get to know them a lot better, they’re gonna be more comfortable coming and sitting down in the training room and just talking like you normally would, as opposed to putting up a little bit of a front. The coaches oftentimes have something to ‘hold over their head’ with playing time, so they’re gonna act differently with them. Coach/Player relationships is always an interesting deal, and there’s so many different ways coaches handle that: some are gonna be the real authoritarian, some the warm & fuzzy, but the dynamics with people on the ground level are more than a ‘friend.’ At least it ends up being that. To me, if you’re a coach or trainer, teacher, parent, it doesn’t matter, the first thing you have to have with your student-athletes, kids, is respect, otherwise it doesn’t matter what you know. You have to have that, so I guess I’d become friends with them as soon as the dynamic, the respect was in place. They knew they were gonna get treated with respect, and in turn, they had to treat us with respect. Then you could usually just proceed into friendship. Q: And from your perspective, how was that first step -respect- earned in your particular situation? DO: I think I probably tried -I shouldn’t even say ‘try’- but so many other people who grew up in Nebraska, who used to work in the program, they reflected the state’s values. One of the things you learn by growing up in Nebraska -you don’t realize that you learn it, you just think that’s the way it is everywhere- you’re genuine and fairly transparent. So if an athlete comes in, they don’t necessarily have expectations, “Hey, you’ve got to be a buddy to me,” but it’s fairly reasonable to have expectations to be genuine and honest when dealing with them. So I think that as long as they knew that, that’s a big cornerstone to building good relationships with them. Q: When did you become a full-time trainer? DO: ’89. That’s when Jack Nickolite decided he was going to go to Physician’s Assistant school. We only had the training room down at South Stadium there with Jack, Jerry Weber and George Sullivan as full-time trainers. That year was crazy, that’s how you got to know so many guys, too, because you’d be working with so many sports. So Jack decided we’d need a two-year assignment while he was gone, and I figured it would be pretty good on the resume for those two years then, working both Nebraska Basketball and Football. Q: That’s how you stayed in such great shape, Doak. You never had time to eat! Q: And you talk about the different coaching styles, the dynamic. Any certain coaches’ styles stand out to you? DO: Well, yeah, of course I’m getting off on these tangents and I think the point of your book, you’re trying to identify what separated Nebraska from other places, right? Let me back up a little bit and start with the broader scope why Nebraska was separating itself from other teams of the time. I may have mentioned this to you the last time we talked, but there’s two different schools of thought out there. One, people will say that the football program helped define the characteristics, the personality, what have you, of the state of Nebraska. 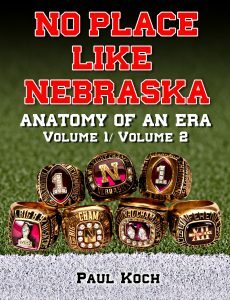 The other school of thought has it that the state of Nebraska helped shape the football program. I firmly believe that the state shaped the football program. If you think about it, there’s a lot of similarities to the guy that’s in Nebraska trying to improve his farm. He’s gonna take what he’s got and improve that farm year after year, getting a little bit better as far as yields, what have you. It’s the same type of cycle with football, where you have a staff that’s stayed intact for a long time, you can make those adjustments and improve. You don’t have to make a big gain all at once. Luckily, we were good and stayed good for a long time, but to me that’s what you’re doing in football: Every year you have a new crop, you’re trying to yield the most bushels out of it. And you know, the farmer-type people of Nebraska, they’re modest, hardworking people. Just like the football team, they’re not going “it’s hard work,” executing, getting a little bit better than the next guy, and that totaled up to become something pretty extraordinary. So I really think that’s been the affection of the state of Nebraska for the football program. They could see some of the same values they grew up believing in reflected in the football program. DO: And also showing the rest of the nation, ”Hey, you might think we’re backwards out here or whatever, we don’t have all the fancy, schmancy whatever…but we know what’s important.” You take care of what’s important, you do a good job at it, and you’re successful. So I think that’s been the real affection for the state, and then of course that’s the very foundation, I believe, for the success of the program. And then you brought those outsiders in that didn’t understand that and did not reflect the same values, and that’s what started some real cracks in that foundation. 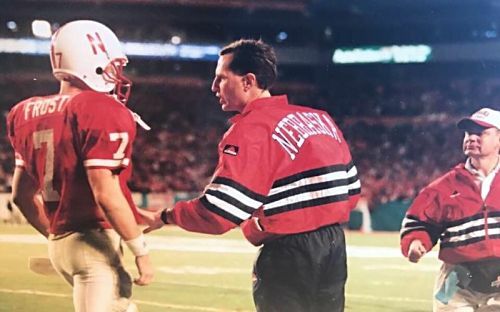 These same people out in Nebraska who’d been supportive for so many years, all of a sudden what’s out on the field was not reflective of what they believed in, that’s when you started to see people leaving games early, at halftime, for a game or two. Q: Would you say the walk-on program was the ‘head of the spear’? DO: The walk-on program was like the mortar in the bricks. You may not get a walk-on to be one of those big, solid stars, but it would bind them together. So you’ve got full support from everybody in the state, and usually somebody would know somebody that’s on the team or part of the team; it might have been somebody in Gothenburg knows somebody in Lexington, so it just made you feel that connection. So then these walk-ons, all they were here for was to play for Nebraska. It wasn’t to get to the NFL or anything like that, their goal was to play at Nebraska or at least be on the team and run out on the field, do whatever. Well, that’s the type of people you need to have this mortar to hold it all together, to make the other bricks stronger. That’s the linking factor of all the towns in the state to support the program, and it’s also the linking factor within the team. Because then those work ethics (which are kind of hard to find except in the Midwest) are built into the other components and into the football team. Q: That’s a good take, Doak. Q: No wonder the world’s so screwed up, right? DO: Yeah, and then you have to think about it and say to yourself, ‘Why is that so unique to the Midwest?’ And I think it comes down to the fact that those values are protected in these small towns. Think about it, things change slowly in small towns and it acts as a kind of preservative. And you think, before people settled here, you have yourself thinking, ‘What kind of person stops here and settles here in this state?’ I mean, you have your gold rush going on, people coming from these beautiful states on the east coast and they go to the west coast, and who’s stopping here? And the dust bowl, who stays? Well, it’s the people who‘ve got that ‘stick to it’ character. More ‘long term result’ people. It’s just that type of person who ended up here. Q: One thing I think makes the Midwest, and Nebraska, really special, is the winters. It toughens you up. It sells you on the point that you don’t have all year to get some things done that you have to do, you have a small timeframe within which to do your work before the weather turns against you and shuts you out, so you better not lollygag and be lazy about life. Otherwise you’re behind the 8-ball and you’re gonna end up paying for it, you know? DO: It goes back to that type of person. How many people do you know, “It’s cold, winter. I’m heading out for the sunny states or whatever.” A Nebraskan is the kind of person who doesn’t mind tolerating the inconveniences, because it is harder to live here than it is in Texas, the extremes are a lot greater. It just comes down to that type of person, what kind of person wants to settle and stake out land in Nebraska? It would be real interesting to do a profile, to find what type of person was willing to settle and stake out land in Nebraska. So that’s a little bit of a broader stroke, but to get back to your question, Coach Osborne stood out to me. He would take all those characteristics in the state (and to me they were even magnified, and part of it is because of his faith). Nebraska’s a pretty conservative, religious people. But he would take it to the extreme a bit. He was smart enough to recognize the resources he had to work with. It’s like anything: no matter where you’re located, you have to know what your resources are. It’s a pretty short-term solution you‘re looking at if you don’t take into consideration the resources you have to play with. Q: Sounds like he was a man who didn’t make excuses for what he didn’t have? DO: Exactly. Another thing we’ve taken for granted here for a long time was the ability to have the same people at the helm. Take somebody who has all the tools but only give them a few years, they only have a chance to learn from their mistakes. Without that, you’re gonna have to hit it right the first time. That’s the deal with today’s college athletics, you only have so much time to do well. You wouldn’t be able to find out the ‘Nebraska Way’, who’s gonna be able to persevere, make adjustments, and be better for the long term. That ability, I think, was pretty darn important. And one thing that was unique, Coach Osborne kind of sheltered us from the rest of the world, because he had seen other places were like. There were a lot of people who never had to worry about getting fired, having radical changes, you know, having that long-term stability. And his values of evaluating people? No matter what your input into the team was, he valued you. For that process to work, it takes time. It’s a bit inhuman to do otherwise. I mean, human nature wants quick results, and if you do something that I don’t like, human nature is to get mad and tell you to leave or whatever. So it was a characteristic of his to be very tolerant of a lot of things, and just trying to get you to do your best, a lot of multiples that come into play.